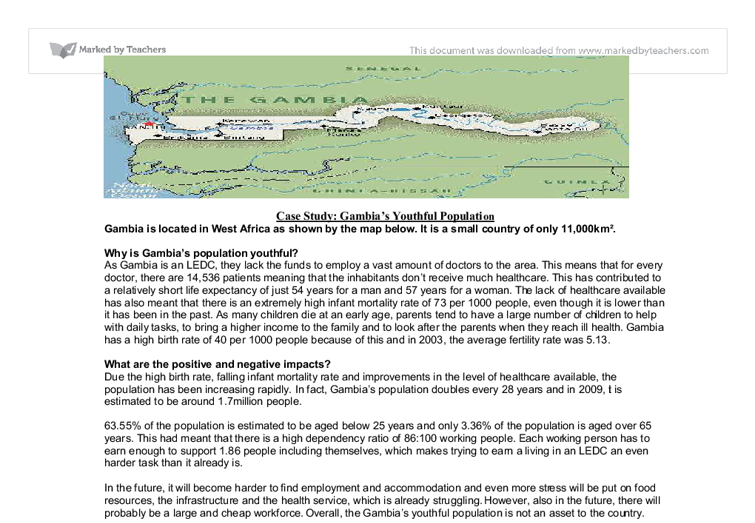 Case Study: Gambia's Youthful Population Gambia is located in West Africa as shown by the map below. It is a small country of only 11,000km�. Why is Gambia's population youthful? As Gambia is an LEDC, they lack the funds to employ a vast amount of doctors to the area. This means that for every doctor, there are 14,536 patients meaning that the inhabitants don't receive much healthcare. This has contributed to a relatively short life expectancy of just 54 years for a man and 57 years for a woman. The lack of healthcare available has also meant that there is an extremely high infant mortality rate of 73 per 1000 people, even though it is lower than it has been in the past. ...read more. 63.55% of the population is estimated to be aged below 25 years and only 3.36% of the population is aged over 65 years. This had meant that there is a high dependency ratio of 86:100 working people. Each working person has to earn enough to support 1.86 people including themselves, which makes trying to earn a living in an LEDC an even harder task than it already is. In the future, it will become harder to find employment and accommodation and even more stress will be put on food resources, the infrastructure and the health service, which is already struggling. However, also in the future, there will probably be a large and cheap workforce. ...read more. The most important observation was that those who had heard the radio drama were more likely to use a method of contraception than those who had not. The number of people using contraception increased from 10% to 27%, so it nearly tripled. The Gambia Family Planning Association were the ones who initiated this radio campaign and they have also made many further attempts to alleviate the problems associated with a youthful population, such as running 8 family planning clinics throughout Gambia. The association focuses mainly on increasing awareness of the contraception available and knowledge of how to use it, whilst also encouraging smaller families and changing the attitudes of the adults living in Gambia. All in all, the results have been very positive. ?? ?? ?? ?? Natasha Morrison ...read more. 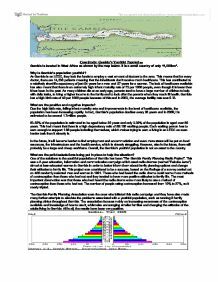 A very good case study of youthful population in The Gambia. A good use of data however this could be strengthened by comparison with other countries and also use of more up-to-date data. The focus on the question is done very well. The candidate sets out what the youthful population is, and then analyses the negatives and positives of the population based on the figures they have got very well. The need a ending conclusion to wrap the essay up. The candidate analyses the population and why the population is low very well, and shows the impact this has on the population. A range of facts and figures are used to back up their points. They also consider the situation and the impacts of these figures well. They make valid conclusions, and points and back up each point with data figures. They show procedures in place to combat this and analyse well how effective they are. The only thing missing is an overall conclusion on the situation. Punctuation, grammar and spelling all done to a very high level. The format and tone of the essay are all done very well. = Birth rate - death rate 10 What causes birth and death rates to change? Medical - Improvements in medical care; In HICs new treatments, such as medicines to combat cancer, are continually being invented to combat diseases, which lead to longer lives and decrease in infant mortality rate. The other thing that causes this problem is the very high ownership of cars. Many people own more than one car. Many roads are being gridlocked for many minutes or sometimes even hours. Also lots of shops , services and offices are located in the CBD so people want to get to them, so the roads are congested. the affect that the development would have on the physical and human environment and how, if the development went ahead, how to stop any harm that would dome from the development. Applications for new roads also go through this process. It is crucial in the preservation of the Lake District. In addition, many buildings in the areas use large skylights and windows to avoid overuse of electricity during the daytime. It also uses artificial earth banks on either side of the settlement to keep the area cool in summer, and warm in winter. This reduces heating costs and electricity usage.